With Hollywood movies and an almost infinite series of comics under his belt, it’s only natural that the merciless justice of Mega-City One's most infamous law enforcer should have his own slot, too. Luckily, slots aren't illegal in the future. Hopefully. 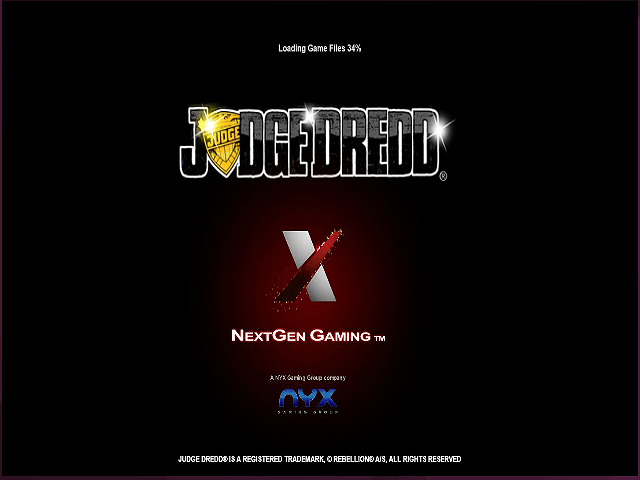 This five-reel, 25-payline slot has the latest visuals and features, and has been developed by NextGen Gaming. It's a glimpse into the darkly comic world of Dredd's day-to-day battle against crime, and if you're lucky enough to shoot straight, you'll be heading home with a jackpot and not to the cubes. 100% Welcome Bonus up to C$1000 + 100 Bonus Spins! 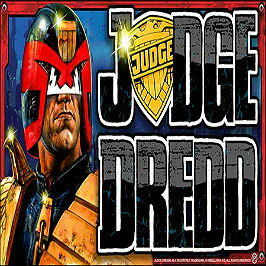 Originally a strip in Eagle, Judge Dredd has since appeared in two films and several video games, and become something of an icon. NextGen has done a great job of capturing the comic book art style, which is great if you're a fan of the Judge's roots. You won't find Karl Urban or Stallone anywhere here, which is a shame, but probably down to licensing. The detailed, light-soaked backdrop of the Mega-City One is impressive and pulls you into the future. The interface itself is simple and clear. You can see through the reels themselves to enjoy the background while you play, but the symbols are still sharp and easy to recognise. The main icons are the Judge himself, his famous Lawgiver pistol, a Judge's glove, Dredd's motorcycle, and what looks like his arch nemesis, Judge Death. There are also numbers and letters added in, as you'd expect from any slot. You can bet anything from 0.25 coins up to 50, so there's lots of scope if you're looking for a quick fun game or are aiming for a big win. There are a few superbet aspects (which we'll look at in a moment), but the jackpot itself is a satisfying 2,000 coins if you can grab it. There are also three possible bonus features. 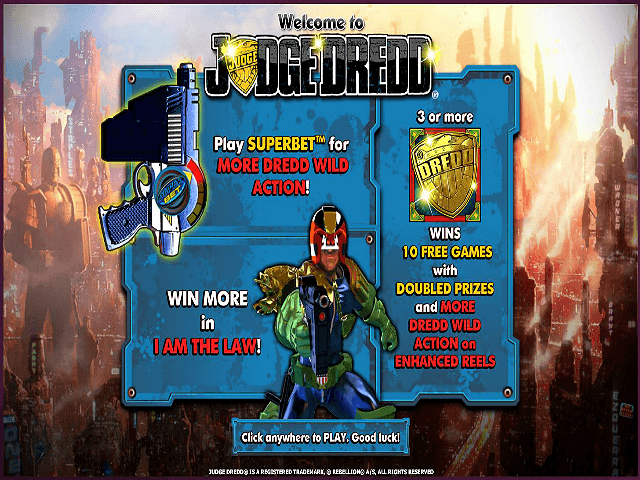 The first thing to note is that you can directly influence your chances of Judge Dredd himself appearing to give you a random bonus, to some extent. The three levels of the superbet determine which reels he might show up on during play. If you go for the maximum superbet, he can appear on all reels. This does raise your stakes, but it can be worth it. If you get three of Dredd's badges, you activate the free spin mode with a two-times multiplier – nothing to shy away from. What's more, if you can land more scatters while in this mode, you can keep it going. The final offering is the option to gamble your winnings. This is for those with nerves of steel (a man of steel? ), but you can double or even quadruple your prize if you guess the colour suit of the cards that are drawn. 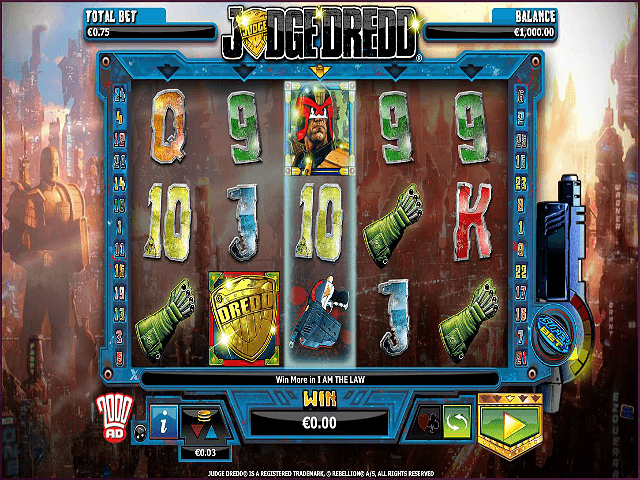 Judge Dredd is a solid slot game with lots of features, and a real pleasure to look at – especially if you're a fan of the Judge himself. 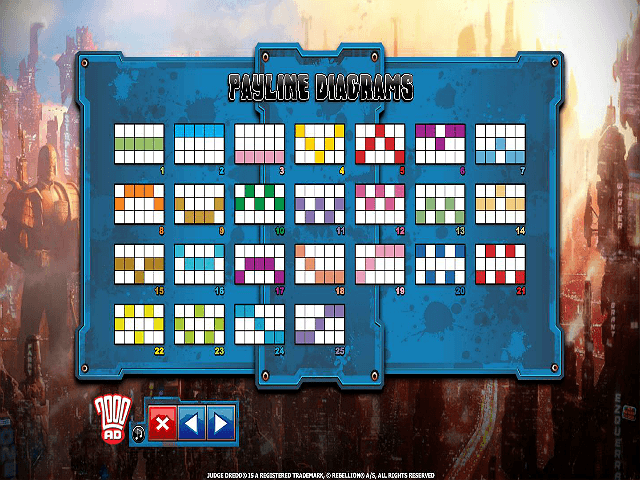 If you like Judge Dredd - You'll like these slots too!